Compared to the Intel Celeron processor-based Acer Chromebook R 11, this new device was more responsive during tasks in various apps. Principled Technologies (PT) compared the performance of two Chromebooks across various education apps. PT found that the Intel Core processor-powered HP Chromebook x2 saved time during tasks in many apps compared to the Intel Celeron processor-based Acer Chromebook R 11. In addition, the HP Chromebook x2 boasts new features, such as an active pen for notetaking, and offers a 73 percent greater screen resolution. 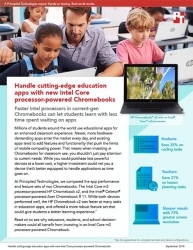 To learn more about how an Intel Core processor-powered Chromebook could benefit classrooms, read the full report at https://facts.pt/057gtj and see the infographic at https://facts.pt/o3ma29. Principled Technologies, Inc. is located in Durham, North Carolina USA. For more information, please visit PrincipledTechnologies.com. Click here to view the list of recent Press Releases from Principled Technologies, Inc.